In December 2012 the Liberal Democratic Party of Japan (LDP - 自民党) decisively won the Lower House (衆議院) elections for the national Diet (国会), securing 294 out of the 480 seats. Between its MPs, and the 31 MPs of its coalitional partner, the New Komeito Party (公明党), Abe Shinzo’s government commanded a comfortable majority of just over 2/3 of the Lower House. In subsequent elections for the Upper House (参議院) in July 2013 LDP gained 114 seats, and the New Komeito Party – 20. All in all, this is a very strong majority, which can guarantee a comfortable governing of Abe’s cabinet. Why then last week the Prime Minister called snap elections for the Lower House – an act that defies the normal logic of democratic governance?There are two competing, albeit not mutually exclusive explanations. The first one has to do with the radical reforms, dubbed “Abeconomics,” which aim at dragging the country’s economy out from two decades long stagnation and deflation enduring. After coming to power, Abe announced three so-called “arrows” of his reforms: fiscal stimulus, monetary easing and structural reforms. The underpinning logic was somewhat straightforward: the fiscal stimulus will pump cash in the economy, encouraging companies to hire more and to pay more their employees thus increasing disposable cash among other things and as a result driving demand upwards; the monetary easing will push inflation through printing money and quantitative easing that would encourage banks to lend more, and companies to build capacity and invest; and the structural reforms will encourage innovation and competition through deregulation, making, at least on theory, the economy more vibrant. But not all went as planned. The inflation came, but the money pumped into the economy did not stimulate the demand. In retrospect, this should have been hardly surprising. The quantitative and qualitative easing (QQE) policy pursuit by the Bank of Japan (BoJ) as of April 2013 was aimed at 2% “healthy” inflation. By the Fall of 2014, however, it was already painfully obvious that the result was not as “healthy” as expected. This prompted BoJ to “double” the QQE as of October 31 in a bold move to revert its odds. This in its own account is an extremely bold move, even with the existing backing at both houses the government enjoyed, enabling it to continue sustaining the ever-stronger political shocks. Coupled together with the fiscal stimulus, the monetary easing caused the Japanese yen (JPY) sharply to depreciate. Big Japanese international companies’ export of production became cheaper and their profitability grew. As a result many investors dumped their hardly profitable government bonds, whose yield was hard hit by the incoming inflation, and went to the stock market. But there is one problem – instead of stimulating spending, this course of events led to greater stagnation of the economy, and just a couple of weeks ago Japan officially plunged back into recession. This is mainly due to the fact that unlike big investors, ordinary Japanese people rarely, if at all, own stocks. The boost of extra cash from the recent market equilibristic aiming to stimulate them to spend or invest folded, as the cash did not end in their hands. Small and mid-size companies also were hard hit by the unfolding of the events, as they are heavily dependent on imported resources, which grew more and more expensive with the depreciation of the yen. Japanese did not stroll the stores, and the majority of small and mid-size companies did not dive into wild investment and innovation. They all clung to the best known tactic for survival – small-scale, risk-averse austerity. In addition, another shock hit consumers’ pockets over the past eight months. In April this year the government introduced the long expected hike of the consumption tax – a sort of Value Added Tax (VAT), from 5% to 8%, as previously contemplated and proposed by the previous government of the Democratic Party of Japan (DPJ -民主党). The tax was necessary, and even unavoidable, because of the record-high domestic debt of around 240% of the GDP – by far the largest in the world (remember, Greece succumbed into a deep crisis and accelerated the so-called euro-crisis at domestic debt levels at around 125% of their GDP). Be this measure as unpopular as it might, what really no one talks about – quite surprisingly so, too – is the actual hidden real size of the tax. Here I talk more from an anecdotal, first person experience. But it should be proven valid through easy empirical tests. What before the tax hike cost in the store JPY100 (around $1) had already the consumption tax of 5% included in the price. This was true almost universally. Now, however, its new price is listed as JPY100 plus 8% tax, thus pushing the final cost to JPY108. The claim is both valid and observable across the board for more or less all products that I have surveyed over the past two and half months, and in all parts of Tokyo I visited. The reason seems fairly simple – producers used the tax hike as a cover to push their prices up, in attempt to offset the inflation rate. There may be a wide range of causes for their decision, such as higher cost of production, change of price they pay for basic resources (which they have to import at much higher cost now, due to the depreciated value of the yen among other things, etc.). What is important, however, is the end result of an effective consumption hike of net 8%, thus pushing the accumulated hidden, yet quite real tax to 13% compared to a year ago. Consumers are not blind, and quite naturally will not hit the stores on the expected shopping spree. None of the abovementioned, however, still explains the controversial decision by Abe Shinzo to call the snap elections, especially when his cabinet enjoyed the comfortable majority in both, the Lower and Upper houses of the Diet. As it seems, the economic analysis, be as valid and helpful as it might, is not merely enough to explain why in many parliamentary democracies governments with minimal support cling to their power for as long as they can in order to complete the set of reforms they promised to enact, while in Japan this is quite the opposite – a government with a strong parliamentarian support is swiftly moving towards new elections. To add to this puzzle is also the fact that since coming to power in late 2012, Abe’s government, and also his personal approval ratings, have both plummeted from over 73% back then to less than 55% now. This fact alone guarantees Abe’s a certain loss of seats in the Lower House. So, what is the cause of all this? The second explanation, apart from the economic one, has everything to do with politics. The not so obvious culprit – the deep cause, to use Joseph Nye’s analytical framework – is the political, and more precisely electoral, system in Japan. With other parliamentary (British) democracies with double chambers, Japan has a many common characteristics. One of the less commonly shared, but certainly not unique either, is that in Japan the MPs for both houses are directly elected – a feature shared with other developed democracies, such as the Belgian, Italian, Spanish and Swiss ones, for example. What makes the Japanese electoral system unique, though, is the timing for these elections: both houses are elected in separate elections, and both have different electoral cycles. The Lower House holds (or rather should hold) regular elections every four years, and the Upper House – every three years. This, in sum, means that in a 12-year period Japan will have seven separate elections, if they are held according to the regular schedule, and perhaps six, if at some point the elections coincide with each other, an occurrence that even theoretically seems extremely rare to happen. A cursory review of the history of snapped elections in Japan over the past 25 years or so would reveal that in many cases the sitting prime minister has dissolved the Lower House and called snap elections in anticipation of the upcoming Upper House elections. Securing the backing of the Upper House in elections – a sort of mid-term electoral test in the US context – is believed to be an extremely important condition for any government in Japan to survive on a long term, especially if it is to enact a set of sweeping reforms. 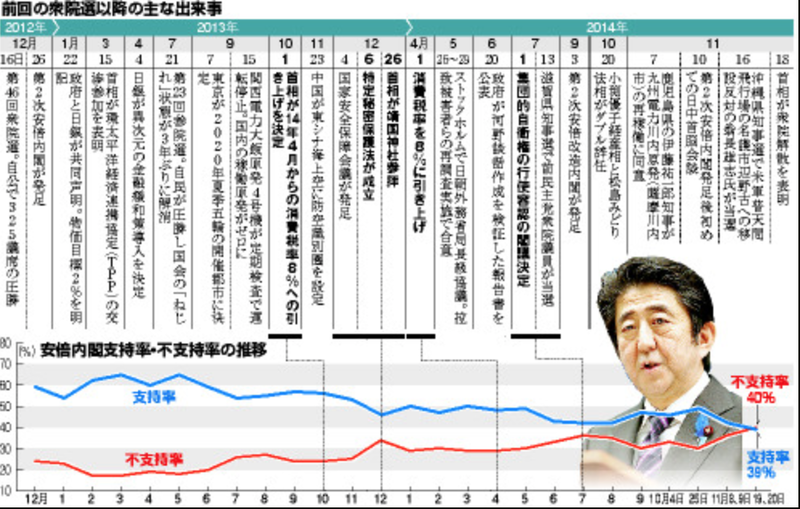 The problem with this explanation with regard to Abe’s government, however, is that in July 2013 LDP already won a comfortable number of seats 114 out of 242 in the Upper House, and the coalitional partner, the New Komeito Party, additional 20. This is more than enough for Abe’s government not to worry too much. While this systemic, macro explanation doesn’t offer the necessary answer, it adds to the picture by providing a background for the decision. The intermediate cause is the slumping approval rating of both Abe and his government. 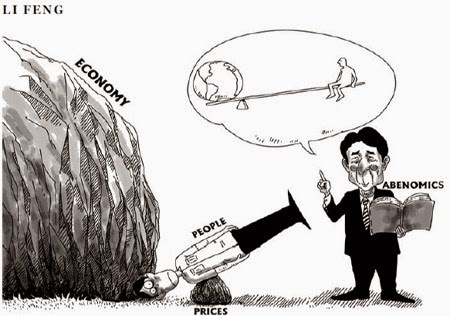 Most Japanese seem disillusioned with the promise for long-term prosperity at the cost of what the current financial minister, Aso Taro, a former prime minister himself and a close partner to Abe Shinzo in the application of the Abeconomics, called “Shock and Awe” policy. Add to this also the number of recent scandals that mired the government, and in particular the last two that forced the resignation of two of the five female members of the cabinet, in alleged corruption and illicit financing scandals, and the need for greater public support for further reforms starts to take shape. The controversial snap elections decision, however, comes into focus only after accounting for the third, precipitating, cause – Abe’s desire to hold on to power inside his own LDP party. As the internal elections for party chairman are due in less than a year time, his only chance to hold on to the premiership and thus push ahead with his reform agenda is to secure his own position inside the party. Winning a new mandate at a national level, Abe will be able to boost his intra-party standing and thus secure another tenure ahead of LDP. Yet, again, this explanation would still be insufficient to explain completely his move. If all this fuzz is really about Abenomics alone, including the now postponed additional hike of the consumption tax to 10%, what does it matter whether he remains ahead of the party or not, if the governing body of the LDP is united behind the need for these reforms (and one can hardly see how they might not be)? Aso Taro even calls the “arrows” not just that, but being instead “bazookas,” implying the magnitude of the expected changes. Such large-scale reforms cannot be easily derailed by internal elections, even if the leadership changes. The abovementioned reasons notwithstanding, the actual cause for the current controversial decision is not a move in a grand-scale political and economic gambit, but a poker move in a very different game – the earthmoving reform of the Japanese Constitution and the abolition of its Article 9. The act of constitutional change deserves an analysis in its own merit that is out of the current scope of this commentary, but the mere act of it has anything to do with the current electoral crisis in the country. Under unprecedented pressure from Washington, and after embarking on a dangerous, but perhaps well justified in the context of the current China’s rise and rapid changing security environment both in the Asia-Pacific, and in the world as a whole, attempt to change the military standing of Japan in the region, the government struggles with internal and external opposition to the proposed change. Senior LDP lawmakers have come out on record to voice their concern and opposition to the change, out of fear for triggering a security dilemma with the neighbors, and also symbolically parting with the most powerful testimony of Japan’s cultural change since the end of WWII. Like the majority of the ordinary Japanese, the New Komeito Party, LDPs coalitional partner, also shares those concerns, and sometimes openly, sometimes covertly seeks to stall the constitutional change. 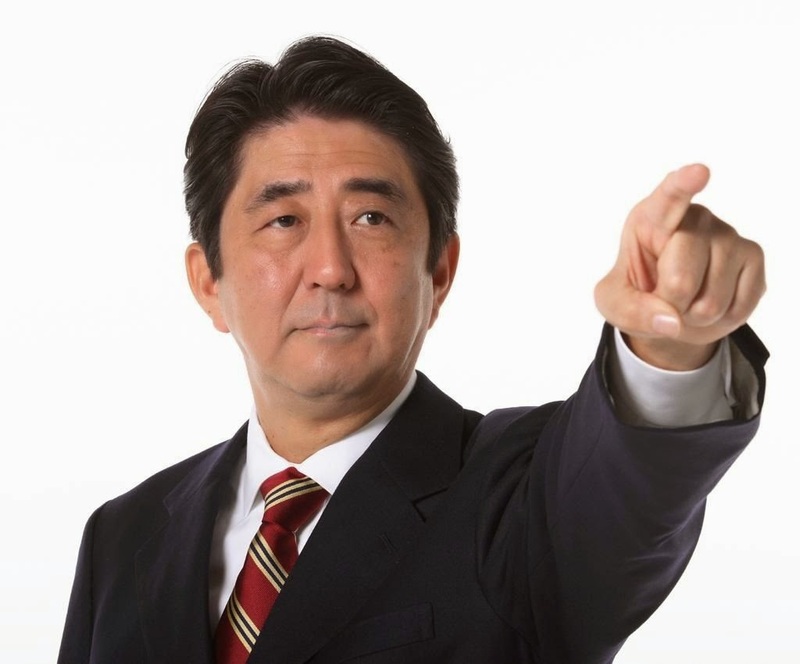 Abe’s bold move for new elections, coming with the price tag of over JPY60 billion (about $510 million) of taxpayers money, has anything to do with reshuffling the current Japanese political plainfield so that the constitutional changes would pass. One has to add to this the no less controversial decision to reopen 30+ of the currently closed nuclear power plants, thus not only defying the popular opposition to return to a dangerous source of energy with unintended consequences, as the crippled Fukushima accident shows, but also to what many analysts believe is the necessity to accumulate used nuclear fuel that at some later point could be converted into weapons-grade one, and used in what more and more seems an impending nuclear arm race in a geographical region, hosting by far the largest number of nuclear countries in the world. But for a country that is the only one in the world of being hit by atomic bombs (and let’s hope it stays so), the potential long-term goal of entering into the nuclear race holds more than just a symbolic meaning. Its pain remains real for many, especially the older generation Japanese living in the south of the country. Abe’s move cannot be explain otherwise, but as a bold poker move. Whether it is a bluff, or holding a real strong hand, we are about to see in the not so distant future.